Small animal veterinary practices were uncommon until the 1920s, when the rapid disappearance of working horses in cities forced many large animal vets to either close their practices or learn how to care for pet animals. The University of Pennsylvania was the first American vet school to open a clinic for dogs. (Until the 1960s, the majority of vets still trained to be large-animal specialists.) The earliest small animal clinics all seem to have been located in big cities. I’ve discussed this in an earlier post, on a Los Angeles dog hospital from 1917; take a look at “Dr. Byles’ Dog Hospital, 1917” from November 2014. I recently came into a very rare — and very fragile — little booklet titled The Dog. 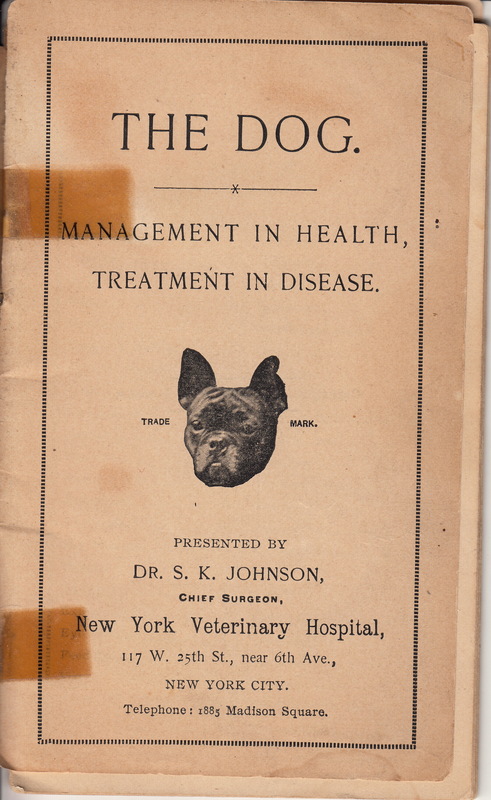 Management in Health, Treatment in Disease by Dr. S. K. Johnson, the “Chief Surgeon” of the New York Veterinary Hospital, located at 117 West 25th Street in New York City. Published in 1900, the booklet had several purposes. First, it promoted Dr. Johnson’s Dog Remedies, a line of over-the counter medicines and a flea shampoo. The text offered “principal symptoms in plain language” so that a sick dog could be “diagnosed and treated intelligently and promptly by any person.” The booklet also offered consultation with “canine specialists” through the mail for $2.00 (prepaid, of course). Dr. Johnson introduced himself as the “consulting Veterinarian” to the American Society for the Prevention of Cruelty to Animals. I’ll try to look into his career and will let you know if I find anything more. He also used to booklet to promote the Canine department o the New York Veterinary Hospital, “under exclusive charge of canine specialists for the past Eighteen years,” suggesting that it was founded in 1882, two years before the University of Pennsylvania founded its dog clinic! I wonder whether Dr. Johnson was trained in England or Germany, where small-animal medicine was more advanced than in this country. It is needless to state that during that period an enormous number of dogs and cats have been treated….From the most trivial to the most serious cases, from the slightest to the most critical operations have been performed on dogs and cats. This immense experience, obtained by our specialists in the treatment of diseases, has resulted in the most perfect methods and remedies…the best, surest, and safest cure…compounded in Our own laboratory under the direct supervision of able chemists and veterinarians. To support these claims, and perhaps to attract new patients to 117 West 25th Street, the booklet also offered photo-mechanical images of the practice. Their quality isn’t very good, but they are still a remarkable record of an early small-animal clinic. 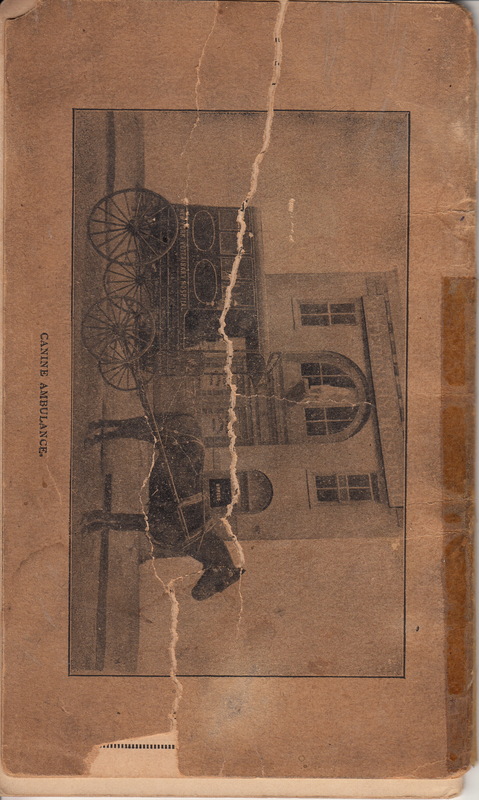 The hospital still treated equine patients, too. If you go back to my post on Dr. Byles’ Los Angeles dog hospital, you can see how much modern small-animal practices changed, partly to reflect improved sanitation and partly to appeal to owners who expected their pets’ medical practice to look as modern and clean as their own doctors’ offices. The Canine Ambulance of the New York Veterinary Hospital. Back cover of The Dog. Management in Health, Treatment in Disease, 1900. Early dog hospitals often had ambulances since urban pet owners had no way to transport their sick or hurt animals to the clinic. Inside cover of The Dog. Management in Health, Treatment in Disease, Dr. S. K. Johnson, author. 1900. The two dark lines are from old repairs with cellophane tape. Consultation and Reception Offices Canine Department. New York Veterinary Hospital. From The Dog. Management in Health, Treatment in Disease, 1900. 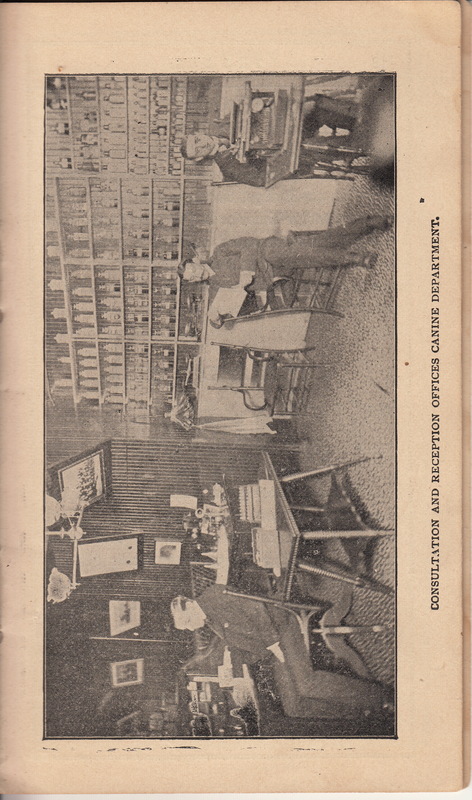 Notice the display of medicines on the back wall. 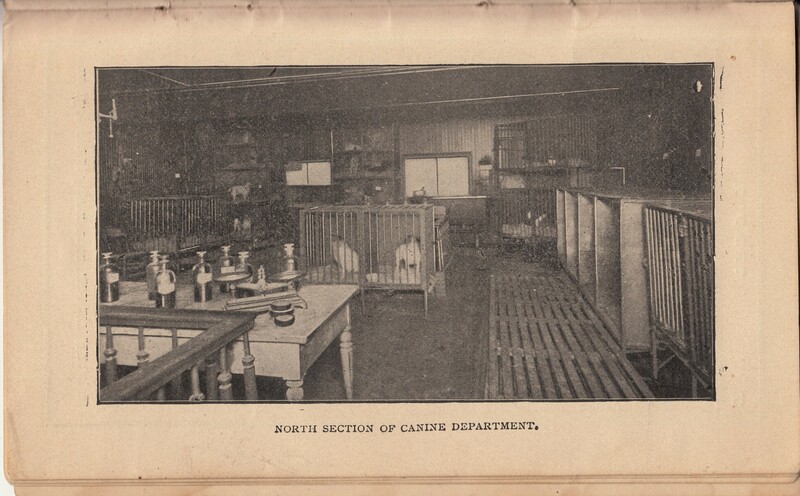 North Section of the Canine Department, New York Veterinary Hospital. From The Dog. Management in Health, Treatment in Disease, 1900. A couple of patients in kennels are visible behind the table with medicines. 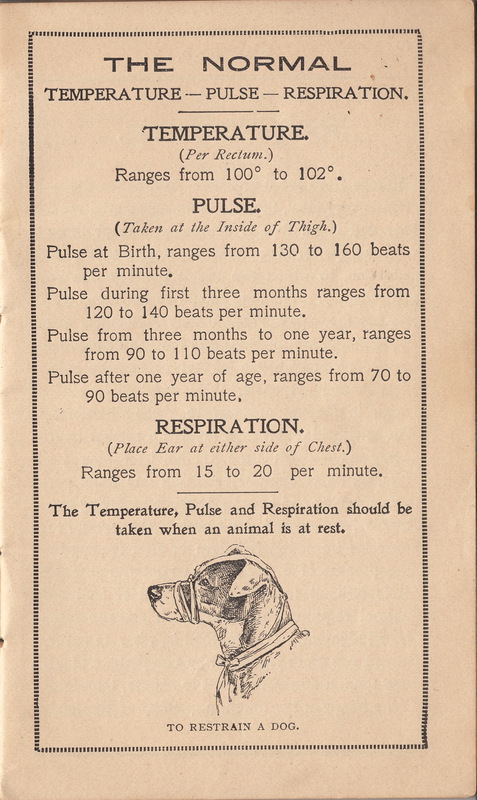 “The Normal Temperature – Pulse – Respiration.” The Dog. Management in Health, Treatment in Disease included information to help pet owners evaluate their sick pets. The illustration showed how to create a cloth tape muzzle to prevent a dog bite. Previous A Mysterious Family Photograph, 1895 — with Dog! I agree. How cool are these old photos!! Thank you for this link! After I did the post, I realized that Dr. Johnson was the founder of Hartsdale Canine Cemetery! And I look forward to following your blog, too! Thank you for sharing this! I love when contributors help to build out my posts with wonderful details like this one!